Washington Cake: Dense, moist, and chock full of raisins. Today we have a guest post from my intern, J.C. Paradiso! She’s a trained chef with her masters in Food Studies from NYU, and this “semester”, we’re working towards launching her own blog under the handle The Savage and the Sage. Look for it soon! Presidents’ Day has never really resonated for me. If you are like me, a holiday just isn’t a holiday unless there is some kind of food involved. No food memories, no holiday. I did some digging and realized that there is no holiday called Presidents’ Day. The holiday we celebrate is officially called Washington’s Birthday. While there may not be food associated with Presidents’ Day today, historically there are food traditions associated with celebrating George Washington. Perhaps the most well known story about George Washington is that of Washington chopping down the cherry tree, which is now regarded as having been fabricated by his biographer, Parson Weems. That being said, according to The Presidents’ Cookbook: Practical Recipes from George Washington to the Present , George Washington apparently loved cherries, and all things cherry continue to have an association with Washington, like marzipan cherries and a chopped-cherry Washington salad. So, what exactly is Washington Cake? While there are a few variations, the first published recipe for Washington Cake that I could find appeared in 1831 in The Cook Not Mad or Rational Cookery, A Frontier Cookbook. It called for “One pound of sugar, one of flour, half pound butter, four eggs, one pound raisins, one of currants, one gill of brandy, tea cup of cream, spice to your taste.” As was typical of the time, it contained no chemical leavening. And you know what? The Cook Not Mad recipe for Washington Cake is pretty delicious–how could it not be with all that fat and all that sugar? 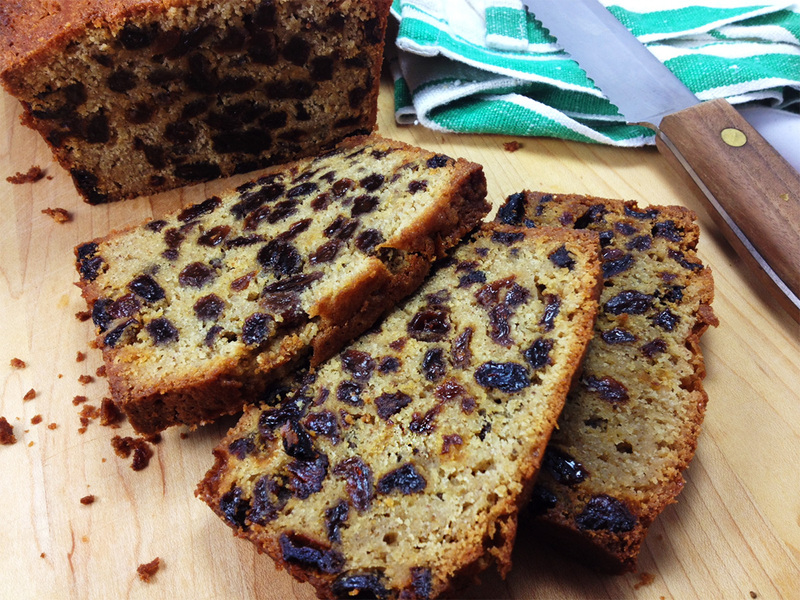 The one caveat is that you really do have to like raisins, because this cake is FULL of them. Adapted from The Cook Not Mad, 1831. 1.Pre-heat oven to 325 degrees. Grease a 9×5 inch loaf pan and set aside. 2.Cream together butter and sugar until mixture is light and fluffy and the color is light yellow, about 3 minutes on medium high speed. 3.Continue to beat mixture on medium high speed, adding in eggs 1 at a time. Add in remaining wet ingredients (brandy and cream). 4.Fold flour, by hand, into cake batter in three batches. Add in spices. Add in raisins and mix well to fully incorporate all ingredients. 5.Transfer batter to loaf pan and cook for about 80 minutes, or until a cake tester (or knife) inserted into the center of the cake comes out clean. 6. Let cake sit for 15 minutes before removing it from pan.